The second element is enthusiasm. Good fishermen eat, drink, smoke, and chew fishing. When they aren’t fishing, they’re thinking about fishing, and they’re probably planning their next fishing trip (or two). They seek out new information and pour over every tidbit of data they can find that might improve their skills. They surround themselves with like-minded people who share their passion for the sport. They also work to conserve the species they enthusiastically pursue. The third element is just pure old basic instinct. There’s no doubt that some people are drawn to fishing because it’s in their blood. I believe there is a genetic predisposition to stalk prey. Maybe you’ve heard the adage “good fishermen think like a fish.” I think there’s something to that. Successful anglers seem to possess an innate ability to make good decisions about where to find and catch fish. If you’re reading this, you were probably born a fisherman. My guess is that you already recognize your compulsion to fish. I bet you understand the drive to get out on the water in search of the strike. I believe those good instincts you already possess can be honed to a fine edge. I’ve seen a lot of good fishermen become great fishermen by sharpening their inherent talents and learning to trust their good instincts. 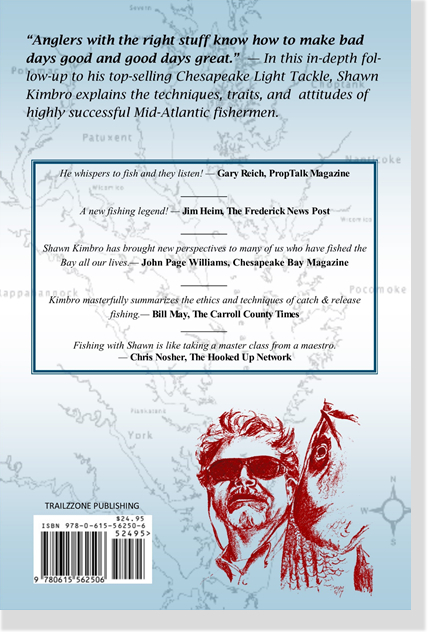 Instinct, enthusiasm, and a willingness to learn: In this book, I hope to examine all three of those elements and apply them to the gear and tackle we use for fishing the Chesapeake Bay and the surrounding Mid-Atlantic region. When anyone writes a fishing book, I believe they should have something new to contribute to the vast body of information that is already available in print and on the Internet. I’m no exception. 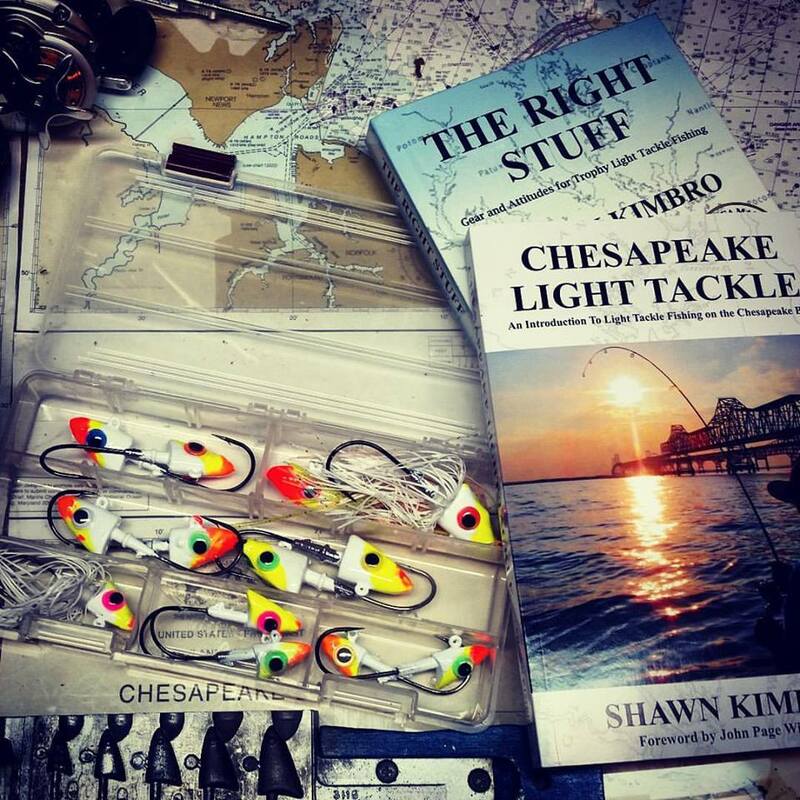 I’ve been very pleased with the reception that my first book,Chesapeake Light Tackle: An Introduction to Light Tackle Fishing on the Chesapeake Bay, has received. Before I put this book together, I sat down and reread that book again. Conditions change and fish behaviors vary, but I believe Chesapeake Light Tackle is still a solid and definitive introduction to light tackle fishing. I proudly stand behind everything I wrote in it. It’s been extremely satisfying to document the many things I’ve learned since I moved to the mid-Atlantic region nearly a decade ago. I especially appreciate the hundreds of notes of thanks from fishermen who, as a result of my writing, have adopted casting as a productive big-fish-catching technique. There’s nothing wrong with trolling, but you don’t have to pull two-dozen broomsticks behind a boat to catch a trophy fish. This book is intended as both a companion volume, and to expound upon the principles I wrote about in Chesapeake Light Tackle. It’s not so much a how-to manual as it is a collection of tips and tricks to help you apply those techniques. I believe it will stand on its own as a helpful reference for light tackle casting. Because of the success of Chesapeake Light Tackle, I’ve had the pleasure of meeting and speaking with thousands of fishermen at clubs, seminars, and book signings throughout the Mid-Atlantic. I’m amazed, and frequently surprised, at the vast body of fishing knowledge out there, and wonder if it might be possible to compile all of that collective knowledge into a single publication. If you could, I bet all that information would fill a stack of books so long it would stretch from Havre de Grace to the Chesapeake Bay Bridge Tunnel. I can’t possibly hope to document it all, but there’s no doubt that, as a result of meeting many fishermen and hearing their stories, I’ve gained an incredible amount of knowledge that I want to share. One of my favorite quotes from the Bible comes from the book of Luke. It reads, “To whom much is given, much is required.” I believe that verse can apply to almost every walk of life, and certainly to fishing. Frankly, I’ve been blessed. Since I’ve met so many knowledgeable fishermen, I feel indebted and somewhat obligated to share some of the gems I’ve learned. This book is a collection of many of those discoveries, along with a few tips I’ve acquired on my own after 50-plus years of fishing. ….Continued…. Read your first book this summer, applied the tactics you shared and had the best late summer/fall I can remember. I will, without a doubt, buy the new book to enjoy over winter. Have you posted dates and places for your winter seminar schedule? I’m still working on the winter schedule, Pat. Thanks for asking and for the nice comments. Congratulations. We are looking forward to the book’s release and the ensuing party. I know both will be great. Mark, thank you for your help and encouragement. Congratulations Mr. Kimbro. Your first book has had such an impact on so many anglers. I can’t wait to read this one! Shawn’s first book changed the way I fished and then actually changed my life. I met my new wife on a light tackle trip! Hi Shawn, I just contacted Rich King (DSF) asking him to give me a gift suggestion for my son. He recommended your new book. I am thrilled to be able to give him something I know he will love to receive. Rich met my son 2 years ago when my son Ben Smith broke the DE state record for striped bass @ 52 pounds. Rich thought you might sign the book for Ben. Is there any chance I could buy it in time to give it to him for Christmas? Fingers crossed here. Thank you so much and best wishes with your new book! Hi Barbara — First of all, congratulations to Ben for that BIG FISH! I just spoke to Rich as well. We expect to mail books in plenty of time for Christmas. I’ll make sure and sign it for him as well. Thank you! Thank you so much, Ben is going to love your book! I read the sneak preview and it describes Ben to a tee. He is willing to learn and is generous with teaching others. Talk about enthusiasm, Ben went fishing on the morning of his wedding day last year and went fishing in Mexico on his honeymoon! I just figured out how to order your book and will get your other book too. Thank you! Looking forward to your new book. Your website, book, and lectures have been a great inspiration and provided great assistance in improving my jigging technique and jig head preparation. As a right hander used to spinning reels, I’m finding that using a left handed baitcaster is more efficient for me and giving me finer control of jigs, especially with depth adjustments and feeling the bottom. Thanks for all the insights you share. I’m in for a special CCA edition, come what may. 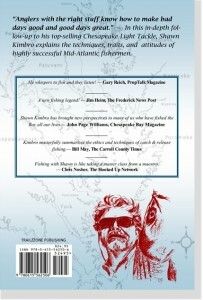 Another tremendous contribution to the art and science of fishing on the Chesapeake Bay. A “must have” read! Thank you so much for the autographed copy. I got my copy tonight and it is awesome. There are some beautiful people in this book. And a couple of ugly ones as well. Something for everyone. But the fishing information and techniques are most excellent. Looking forward to the CCA edition. Easy read and great tips. My wife asks why another rockfish book? Different fish than the last book!!! Your closing discussion of 3D reefs is right on the mark. One of the rationales I pushed when introducing Reef Balls to the reef program prior to MARI was the instant re-creation, when set with spat, of oyster rocks. The first spat set experiment with DNR and Horn Point for Memorial Reef and the subsequent adoption of this technique by CBF at their Shady Side facility for the Cooks Point and Hollicutts Noose reefs have demonstrated the technical viability of artificial spat set on appropriately designed manufactured reef units. The smaller units are great for hands-on volunteer pours, which MD Environmental Service, CBF, Magothy River Association, Oyster Recovery Partnership, several MSSA chapters, and Chesapeake Bay Environmental Center pioneered for MD Bay waters. Although a high cost option per oyster, Reef Balls enable the oysters to be off the bottom in healthier water on units that are structurally designed for a 100+ year life span, providing instant and enduring reef structure even before populated with marine species. The units will also take a natural spat set in favorable locations, like the Dorchester sanctuary reef. The Reef Ball units off Pt. Lookout, although they didn’t get a spat set, were completely covered in anemones the first year in the water. The Reef Balls at Little Cover Point are also heavily encrusted with marine organisms. When we put the Reef Balls from the early MES/CBF Shady Side volunteer pours in at Hollicutts Noose with CBF’s PATRICIA CAMPBELL, we dropped a small underwater camera and saw a striped bass checking out the units 15 minutes after the last one was placed! Similarly, we observed a school of fish cruising around the Reef Balls at Memorial Reef (when lowered, the camera hit a catfish on the nose alongside a Reef Ball). The units there experienced heavy natural colonization by mussels. Wishing you continued success in helping get important conservation messages out to the recreational fishing public.